The most popular version of home-made cakes - made of biscuit. 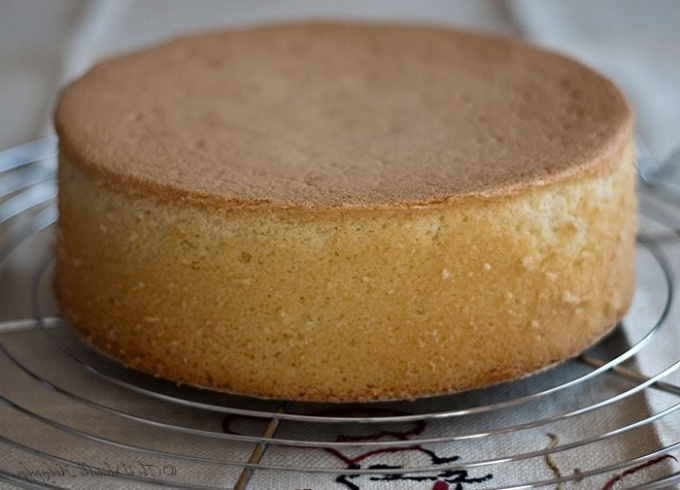 Sponge cakes can be baked in form pan. Finished products soak with syrup, then promazyvaetsya cream. Properly baked biscuit puff and lush, it holds its shape well. To prepare the sponge cake a snap. Separate the yolks from the whites and RUB with sugar until it dissolves. The proteins shake in a solid foam, and then enter half of the protein mixture into the yolks. Add the sifted flour and the remaining egg whites, gently mixing the dough from top to bottom. To cake turned out delicious, observe the proportions of ingredients. Baking skin weight 640 g will need 1 Cup of wheat flour, 6 eggs and 6 tablespoons sugar. That the cakes were airy, follow the rules of baking biscuit. Put the dough in the form greased with oil and place in oven preheated to 200-220оС. Baking time depends on the thickness of the layer and ranges from 10 to 50 minutes. To check the readiness of the product with a wooden splinter - after sticking in the cake it should not remain traces of the test. Below cakes are not lost during baking try not to open the oven door. The finished cakes before impregnating you need a good cooling. Let them stand for a few hours. If you do not, after impregnation, the cake may fall apart. A thick cake can be cut into several thin layers. Do it with a special knife-string - it gives the biscuit to crumble. Shortbread can be baked delicious crumbly cakes for homemade cakes and pastries. Their coat with jam, whipped cream or any cream from sour cream to the custard. Shortcake are more fatty and dense, they hold their shape well. Most often they are round or rectangular. The most delicious sand cakes are prepared on the basis of butter. But if desired it can be replaced with margarine high quality, specially designed for baking. For making cakes with a total mass of 900 g, you will need 300 g of butter, 3 cups flour, 2 eggs and 1 Cup sugar. If you use unsalted butter in the dough you need to add a bit of salt. To prepare shortcake, even novice mistress. Butter, eggs and sugar pulverized into a homogeneous mass, then it osypaetsya sifted flour. The dough is kneaded by hand and then cooled in the refrigerator. The oil contained in the dough melts quickly, so mixing and baking is very important to observe the temperature regime. The finished dough roll out on Board sprinkled with flour. Plast prick with a knife in several places and place on a baking sheet or in a form, and then place it in a well heated oven. Don't make the cakes too thick - they will not be able to grilled. Cook the product at a temperature of 230-250oC until evenly Golden brown. Removing the cakes from the pan, be very careful - fragile sand products break easily.